Easy to assemble, but don't hit the racks too hard with the rubber mallet or you will slightly bend the shelves. Took about an hour to assemble. Seems very study and is quite heavy. It holds more weight if you use the "feet" and not the wheels. Genius system for storing odds and ends in the garage. The rack I received only has 16 bins, though, and the instruction manual said it was 72" tall, which it's not, so there's some confusion there. Store supplies and tools with Seville Classics Bin Rack Shelving system. Unit features gray bins in three different sizes. Bins slide out and lock for safe, easy access. System is certified by the NSF to NSF/ANSI Standard 2 - Food Equipment, for use in commercial environments. Our shelves are designed for heavy-duty work with industrial-strength steel wire and a platinum epoxy powder coat for defense against corrosion. Ideal for use in garages, warehouses, mail rooms, schools, offices, work centers, and retail environments. Dimensions 14.0 In. X 36.0 In. X 56.0 In. 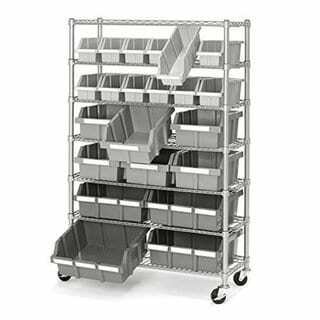 This storage system comes with very heavy duty (thick) plastic bins that allow user to determine whether rack is used with or without included casters (wheels). The metal frame is topped with a wire rack for additional storage options. Purchased for my wife's crafts, I would be just as happy using this in our pantry or in the garage with my tools. Great product that is sturdy and sure to last many years, and through many projects. The rack is smaller than I pictured it even though I knew the measurements. This ended up being a good thing as it doesn't take up much room. It could not have been easier to put together. Once together I started putting my art (some may call it junk) odds and ends into the bins and could not believe how much stuff they hold. I was able to get rid of several storage tubs and now can easily pull out the bins and see what I have. Loved it so much I ordered another that day. The second one was slightly warped so I had to use a mallet to really get the shelves to stay in place and even then they wanted to pop up. Once I got the bins loaded no problem. Wish it was cheaper, I would order more. I am very happy with this purchase. This rack system was easy to assemble and shipping was super fast. I use it in my garage for an organizer rack and it comes in handy for tools and parts. Thanks overstock. I purchased this shelf unit to hold all my craft supplies. Now I can find what i am looking for with ease. I like all the bins. The small ones hold small items so I can keep them organized. I rarely review an item but yall need to know this thing is incredibly frustrating to assemble and I almost bought two of them. When I opened the box I knew it was just what I was looking for. The instructions are good and it looked like it would take 30 minutes to snap together. 3 hours later I was still pounding with a rubber mallet, bending some of the structure and pure torture for my bad shoulder. Quality materials except for those plastic pieces that pop off with each pound. You pound one side in and the other side of the shelf pops out sending that plastic piece flying. If it holds up I still may buy another because it is just perfect for what I wanted it for, storing tools. Maybe 4 people with 4 mallets could synchronize each swing and finish faster. Also wish it came with more tray dividers or more I could purchase. Easy to assemble. Has place to label items. Great value for the price. May not be fancy enough for the garage guru, but great for the amateur. Fast delivery. Very easy to put together. Using this for misc small stuff in the garage. Ready to buy a couple more. It was easy to put together, was able to put it together in 30 minutes. Great for organizing. Loved that it came with labels and option to have it on wheels or legs. This unit is a great way to get organized. We purchased this for our soapmaking business. The different size bins are great because we can sort things according to size and use. I like the gray bins better than the yellow bins. Finally got my basement in order with this. Good storage solution that makes it easy to see everything. Took a bit of time to put together. Great purchase overall. Great product. Holds tons of "stuff". Used it in my pool shed for years, and now it is cleaned off and used in an interior storage room. Easy to move on casters, and easy to remove bins. I have this in my bathroom because I have a lot of stuff. It's not the cutest, but it holds so much and is very strong. It was easy to put together and moves on its wheels. As advertised. Shipping was turned in a reasonable time. Came with broken and missing parts. Not able to put together. We would like to thank Overstock for selling amazing ítems and offering a very friendly and warm service, if there is a problem with our purchase, they will fix ir as son as posible. We have been loyal buyers for more tan 3 years. Thank you Overstock. This item is awesome. Purchased this as a gift for my husband, he just love it! now he keeps all his items well organized in the garage. Perfect fitting. It was shipped quite fast and arrived promptly, It was well packaged and received with no issues. Love the fast that it is on wheels so you can move it around with ease. I ordered two of these to help organize my garage and it works wonders to have the bins for additional organization instead of just the plain shelves. "What tools do you need to assemble?" Screwdriver and pliers is all I used. "Is there a bin separator for each bin?" No, the bins sit on a shelf. "what is the maximum weight capacity for this storage unit?" The rack is very similar in construction to my stainless steal rack. The description for this one doesn't say how much it will hold. The stainless steal rack says 500lbs on the wheels and up to 600lbs without the wheels. This rack is at least as strong if not strong. I think it could hold a lot. You have to build it. It goes together just like the stainless steal one. Very sturdy construction. I hope this helps. "I am confused on the options. One only says grey and the other option says grey 22 inch. What is the difference?" The rack is gray and the bins are different shades of gray. The different sizes are slightly different color. It looks just like the picture. One style has more smaller bins. That is the one I bought for organizing my craft supplies. One style holds 16 larger bins, the other holds 22 bins with smaller bins on the top. "What sizes are the bins? It looks like there are 3 different ones. And are replacements available?" "Are the overall dimensions the same for the 16 bin option and the 22 bin option?" Yes. Only the bin sizes are different with the top 2 rows of the "22" having bins half the size of the ones on the "16". "Does it bring the bins?" Hello nolirivera, this item features 16 durable sliding polypropylene (PP) bins (12 Large, 4 XLarge). Thank you for shopping with us.